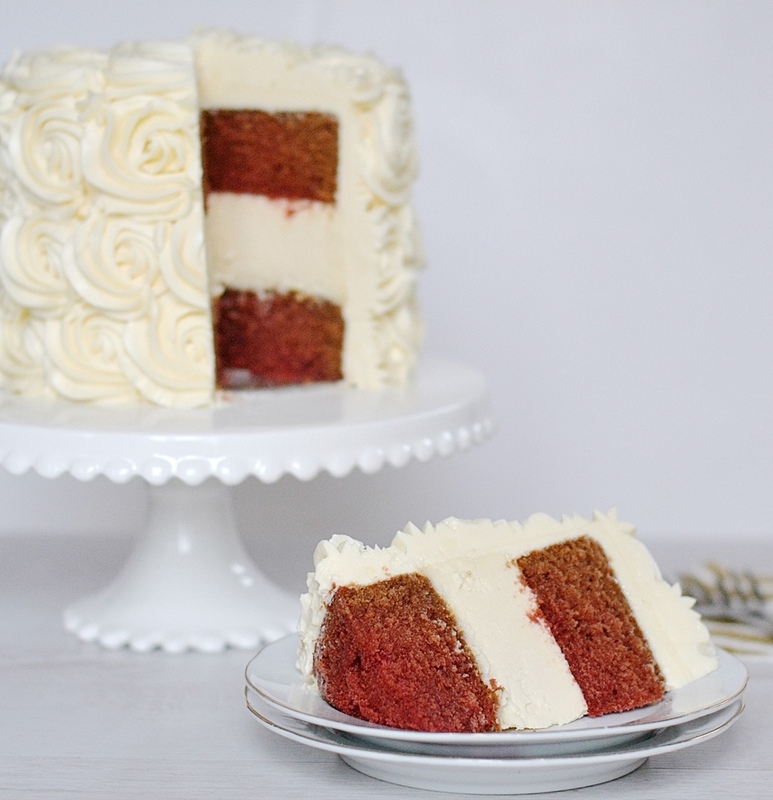 Two layers of soft and moist red velvet cake sandwiching a cheesecake and frosted with white chocolate cream cheese. Let’s talk about this red velvet cheesecake cake. I have baked it a total of 6 times and have never been able to photograph it. It’s a favourite of my daughter Esme. We had it for as a dessert for Christmas dinner and i made this as per her request for New Year’s Day. I don’t know quite what happened with colour of the red velvet cake. Maybe i didn’t mix in the red colour properly. For a minute i almost didn’t share it, but things like this happen. The lack of uniformity of the colour doesn’t take away from how delicious this red velvet cheesecake truly is. The name red velvet cheesecake is quite a mouthful, then i had to go add with white chocolate cream cheese. Shame on me!!! I decided to decorate the cake with one of my favourite piping designs. Using a 1M open star tip i piped roses around the cake. It doesn’t take that much time or effort and you left with a very elegant and beautiful cake. This cake is both beautiful on the outside and the inside. To show how easy it is to pipe roses I made a short video. Preheat oven to 160 degrees C .
In bowl of mixer (or using hand mixer) beat the cream cheese and mascarpone until smooth and creamy, slowly beat in sugar. Add salt. Scrape the sides of bowl as needed. Beat in eggs one at a time until incorporated . Add the sour cream and vanilla extract and beat until well incorporated. Bake for about 60 minutes or until set to touch .Turn off oven and leave cheesecakes in oven for one hour with the door shut. Leave cakes to cool in tins for 10 minutes then run a knife around the edges to loosen them from the sides of the tin. Then invert the cake onto a cooling rack , rounded sides up. Let cool completely. Divide cake batter evenly between cake tins. Bake for 30 minutes or until a tooth pick inserted in middle comes out clean. Pour wet ingredients into dry ingredients and mix until well combined and a smooth batter forms. In the the bowl of a mixer sift together cake flour, sugar, bicarbonate of soda, salt, cocoa powder. In a jug mix together oil, buttermilk, eggs, red food colour, vinegar and vanilla extract. Preheat oven to 170 degrees celcius. Grease and flour 2X 8 inch round cake tins. Wrap cakes up and chill in fridge for about 30 minutes or until ready to frost. Add cream cheese to mixture and beat until fluffy. Beat in vanilla extract and melted white chocolate. Chill crumb coated cake in fridge for 30 minutes until buttercream is nice and firm. The cook time does not include the chilling time and assembling. Cheesecake and cakes can be baked and chilled several days before assembling. For every cup of all purpose( plain ) flour you take out 2 tablespoons of flour and replace with 2 tablespoons of cornstarch. Sift the flour and cornstarch together, sift again and again. The cornstarch and flour need to be well incorporated and flour aerated. sift the flour and cornstarch mixture about 5 times. You have cake flour.